KUALA LUMPUR: Warisan TC Holdings Bhd’s travel and car rental businesses, which are parked under the Mayflower Group, have jumped on the e-commerce bandwagon to convince its corporate customers to go online for their travel booking for both work and leisure trips. In a recent interview with The Edge Financial Daily, Mayflower chief executive officer Chin Ten Hoy said the company’s existing corporate clientele gives it an edge in competing with start-ups that have been very aggressive in expanding their market share. “The good thing is that we have been in the [tourism] business for the past 55 years, and we are not a small player in Malaysia when it comes to corporate travels. So we want to [leverage on] our existing customer base. Imagine a client with 3,000 employees — we want to approach their staff to use our services when it comes to leisure travel as well,” he said. In June, Mayflower Holidays Sdn Bhd set up a joint venture (JV) — Mayflower Online Sdn Bhd — to spearhead a digital initiative that allows customers to make online booking for a variety of travel-related products like flight tickets, accommodation, theme park tickets, car rental, and other tour activities, via an integrated platform. The JV entity is 80% owned by Mayflower Holidays, while the balance is held by Agile Quick Services Sdn Bhd, a company run by the JV’s chief technology officer, Cheah Kwan Cheong. “We have been in the tour service business for many years. No doubt the business is still giving us the numbers, but online booking is gaining traction. Many of the younger generation actually find it more convenient to book online without visiting the outlet,” Chin said. “While we have online booking originally, it was not really a full-fledged online booking portal, so we thought it is timely for us to adapt [to rising online demand],” he added. The new venture came at a time when the travel industry is seeing tremendous digital disruptions, with the entrance of new players, some with pretty substantial financial [ammunition], all thirsting for a share of the market. Less than two months ago, Indonesian online travel company Traveloka raised US$500 million (RM2.09 billion) from bigger players like Expedia in the US and JD.com in China. In comparison, the planned investment for Mayflower Online — at RM10 million over the next five years — seemed like a drop in the bucket. But Chin believes the business has its own niche in the industry as it offers unique value proposition by bundling up various products and services. “We are different from other players in the sense that our bundled products have more value as compared to buying them individually. So consumers can get more value when they buy everything together and they only have to deal with Mayflower Online for peace of mind on their whole trip — that is our goal,” he said. “We are not looking to just be a [pure] marketplace where we have to rely on agents to come in and contribute the products. We offer our own products and we take ownership of them to take care of the customers. We’re not just a platform where we are not sure who the suppliers are or how their services are like,” he added. Booking for flight tickets and accommodation is now available on Mayflower Online which was just launched in June. “Throughout the remaining quarters of this year, we are going to roll out travel insurance, car rental, entrance tickets, transportation like airport transfer, cruises, or train services like JR Rail in Japan, plus tour activities,” said Chin. Among Mayflower Group’s own products that will be hawked on the online portal will come from Mayflower Holidays (Borneo) Sdn Bhd, Mayflower Corporate Travel Services Sdn Bhd and Mayflower Car Rental Sdn Bhd — all under Chin’s purview and wholly owned by Warisan TC. 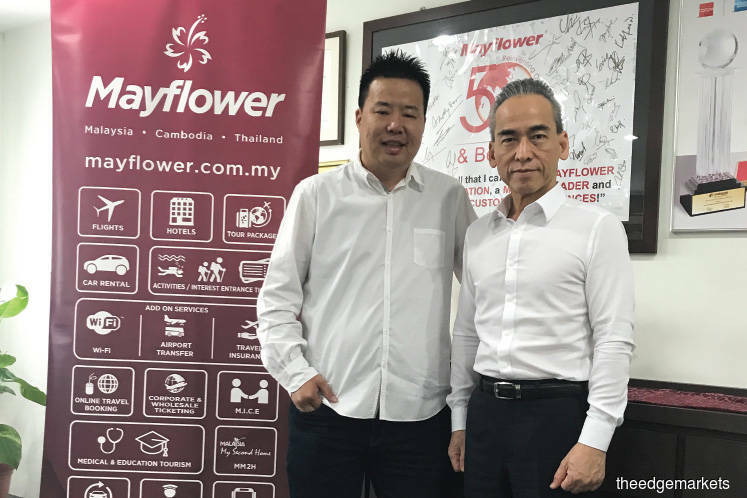 Chin, who is also a member of Warisan TC’s board of directors, said 70% of Mayflower’s travel business comes from corporate clients, while the balance is made up of leisure travel bookings. Moving forward, Chin said he hopes revenue from the leisure booking segment would rise to contribute equally with its corporate segment to Mayflower’s overall top line by FY20. The travel and car rental businesses are the second-largest business within the Warisan TC Group. They accounted for 43.54% of the group’s total revenue of RM446.12 million for financial year ended Dec 31, 2016 (FY16), slightly below the group’s machinery business, which contributed 46.56% of the total turnover. For 2QFY17, Warisan TC recorded a net profit of RM839,000, versus a net loss of RM2.18 million a year ago, as revenue strengthened 10% to RM134.27 million. It was the second straight quarter in the black for the group after posting losses in the four consecutive quarters that made up its FY16. Last Friday, Warisan TC shares closed unchanged at RM1.98, giving it a market capitalisation of RM128.9 million. Year to date, the stock has appreciated some 15%.